"He was my eyes and ears..."
"I have know and worked in the real estate industry with Greg Wilson for 15 years. During that time I've arranged financing personally for hundreds of his customers and funded many millions of dollars of transactions with Greg. I've also been a customer of Greg's personally. 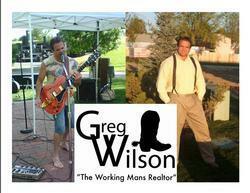 I would not hesitate at all to recommend working with Greg in any way on residential real estate. He works very hard, he is committed to making things work, he always follows through and he is a very honest and loyal person." "...the bottom line is that Greg gets results"
My name is Jeffy Tausend and would like to recommend Greg Wilson as an excellent real estate professional who helped me acquire serveral properties in the Phoenix/Mesa Arizona area. Greg worked diligently to secure the terms and pricing to fit my needs and budget. Greg also utilize his excellent networking skills to expedite that sale of my properties as markets and my properties as markets and my business plan changed. Greg's years of real estate experience and accomplishments look great on paper, but the bottom line is that Greg gets results..."